KUALA LUMPUR: The timing of Malayan Flour Mills Bhd’s (MFM) cash call to raise RM275.1 million is far from perfect. The group’s top management is determined, although it is tougher to get the extra money from shareholders. MFM has decided not to postpone the rights issue until the market sentiment improves simply because the board believes that the exercise is a critical step to raise its game. When MFM announced its rights issue last year, its share price was trading at RM1.12. 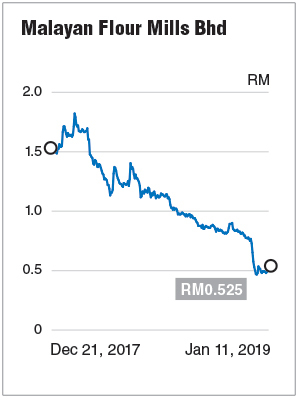 Since then, it has been on a downward slope, more than halved to a low of 52 sen, no thanks to the current weak market sentiment due to domestic and external factors. In short, the rights issue, which offers shareholders options of ordinary shares or redeemable convertible unsecured loan stocks (RCULS), was priced at a discount to the market price initially. The discount, however, has evaporated as the share price dropped. “When we start exploring this (rights issue) in December 2017, the market was still good, but along the way things [have] deteriorated. What we believe is the long-term story, so we [have] decided to get on with the exercise and focus on the operation,” said MFM chief financial officer Cheang Kiat Cheong when asked about the timing of the cash call. “The entire organisation [has] spent a lot of time on this exercise; it is not good for us to postpone, let’s say by another six months. It will send the wrong signal because it shows that even the management is not confident [in the rights issue and the company’s prospects],” he added. Meanwhile, Cheang stressed that the rights issue is a form of capital management exercise to bring down MFM’s gearing as the group has raised debts to finance the downstream expansion plan to cultivate future earnings growth. He also reiterated that the group’s expansion plan, which is mainly venturing into the poultry processing business and aquafarming, will still be on track regardless of whether the cash call does well or not. “We have already started the expansion plan ... the aqua feed mill will be commissioned by February; the jetty will be up and running by May or June this year. The primary processing plant will be ready by [the] second half of this year. So we are committed [to] it (expansion plan),” said Cheang. The rationale, he said, for MFM to seek more capital from shareholders is not to have high borrowings to strain the company’s financials, particularly in the current economic cycle in which an interest hike is highly likely sooner or later. The capital raising will give MFM the financial flexibility while expanding its business to broaden earnings. “We don’t want to push our gearing ratio too high; if we want to fund the expansion with borrowings, we can. But the point is that whether we want to put ourselves in that stressful situation or not? “Especially when the economy is not growing [as strong], with the possibility of [the] interest rate going up, that will put a lot of pressure on our earnings,” Cheang explained. MFM’s gearing ratio is expected to go down to about 0.8 or 0.9 times from between 1.1 and 1.2 times as at end-September 2018, with fresh capital from the rights issue. As at end-September 2018, MFM’s net tangible asset was at RM1.40 per share, compared with its rights issue of ordinary shares at 50 sen per share and the five-year 5% RCULS at RM1 per unit. The rights issue of shares and the RCULS are sweetened by bonus shares and free detachable warrants. Meanwhile, RCULS holders will receive a 5% annual dividend for five years and they are entitled to convert the loan stocks into MFM shares at zero costs at anytime. The structure of the group’s cash call that is made up of new ordinary shares and the RCULS aims to cater to different shareholders’ risk appetite, said Cheang, noting that the RCULS will assure shareholders of a guarantee return of 5% a year for every ringgit they put in. Judging by the company’s net tangible assets (NTA), Cheang pointed out that the rights issue offers cheaper entry for shareholders to ride on the group’s future growth. Post-rights issue, MFM’s-adjusted NTA will be roughly 85 sen per share, equivalent to a 62% premium to the group’s closing price of 52.5 sen last Friday, said Cheang. Today is the deadline for the payment for MFM’s rights issue of shares and the RCULS. Is MFM’s ambitious plan to expand into the downstream food industry attractive enough to whet shareholders’ appetite for more shares? Soon it will be known.